We are proud to announce that Linea Owners Association has selected Tinnelly Law Group as their associations’ legal counsel. 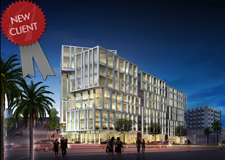 Linea is a luxury mid-rise located in the Hayes Valley area of San Francisco. It was designed by world-renowned architect Bernardo Fort-Brescia, with walls of glass framed by geometric pillars, creating a prism-like effect. Residents enjoy an expansive attended lobby with Italian marble highlights, an interior courtyard with lush plantings and greenery, and a rooftop terrace with multiple areas for entertaining, barbecuing, and enjoying the city lights. Our HOA attorneys and staff look forward to working with Linea’s Board and management.